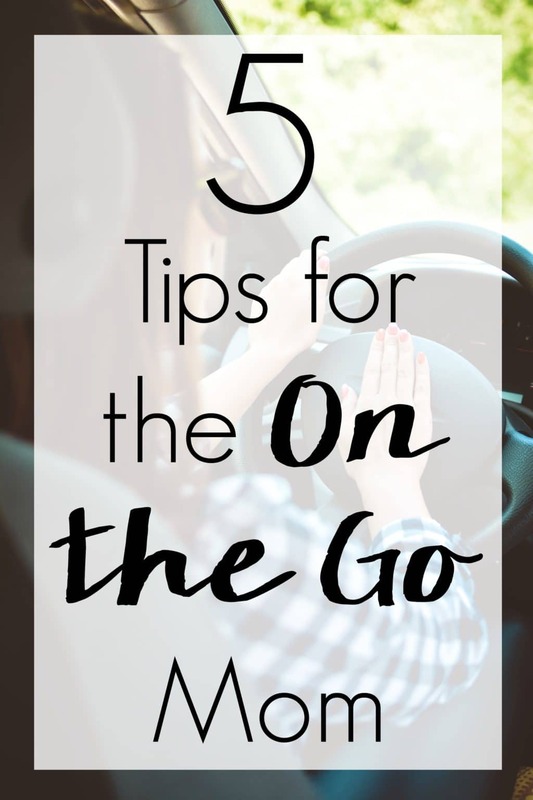 This post with 5 Tips for the On the Go Mom was sponsored by G.H. Cretors. Do you ever feel like your life is spent in the car? Driving from place to place. School drop off to the grocery store then onto your other errands, school pickup, sport practice, only to do it all over again the next day? Or, maybe you’re not in the car quite so much but are still an on-the-go mom who has so many items on her to do list that she never gets a chance to sit down and take a minute for herself. You are not alone. As moms with kids still living at home, we’re in a busy season of life. If we feel overwhelmed by all of this time on the go, our kids feel it even more. Here are 5 Tips for the On the Go Mom to help you be a little more relaxed and prepared for wherever the day takes you! 1. Always have snacks on hand. It never fails. Sometimes we’re not out of the neighborhood, off our street, or even out of the driveway and the girls will start complaining that they’re hungry. Regardless if they’ve just ate or haven’t had a bite in a couple hours, instead of arguing or heading to a drive thru, it’s easier to just give in and always have a few snacks in your bag at all times. My kids are obsessed with snacks. I like to make things quick and easy, but still give them some variety. I love G.H. 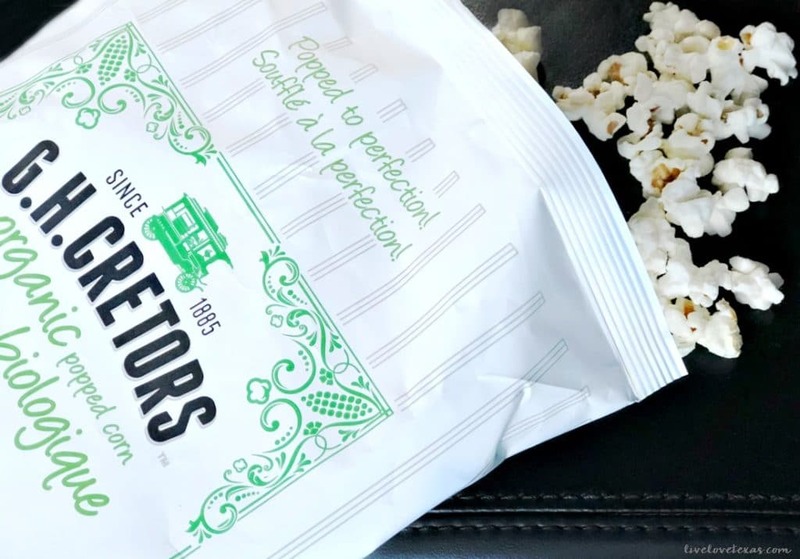 Cretors Popped Corn because there are so many flavors from salty to sweet to spicy so you can hit all of the kids (and mom’s) cravings in one bag . And some bags like The Mix even combine salty and sweet into one delicious combination of flavors. Plus, G.H. Cretors Popped Corn isn’t greasy or sticky when messes happen. And they will happen. 2. Don’t forget the water. No matter how short the trip, I always have water with me when I leave the house. Whether for myself or for one of the girls, someone is going to invariably work up a thirst if I don’t have water. 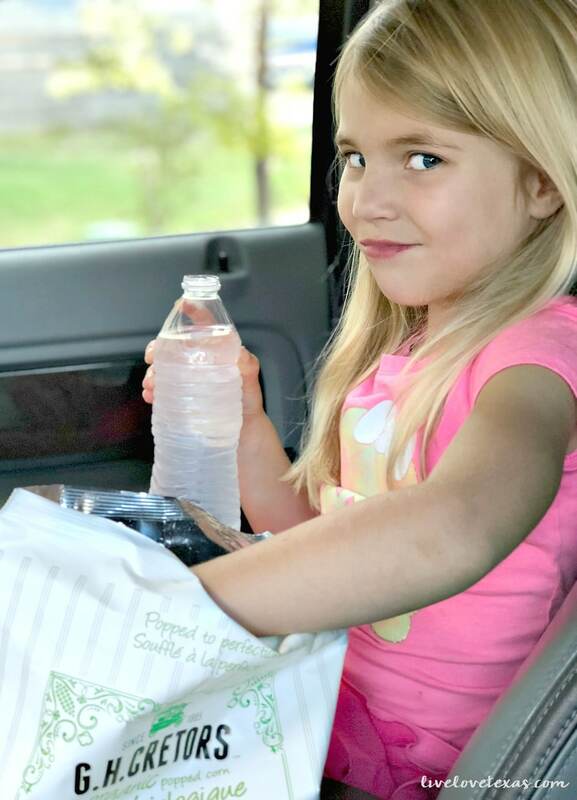 Carrying around a reusable water bottle is an easy way to hit your water goal and the kids aren’t complaining about being thirsty…especially since all of that snacking is invariably going to lead to thirst. 3. Make sure you have entertainment for the entire family. I’ve talked to tons of people about reading and their answer is always that they never have enough time to do it. Contrary to what some might think, listening to an audiobook is the same thing as reading it. Most libraries now have digital lending so you can download audiobooks and ebooks for free. So whether you’re learning a new language or being inspired when you’re in the car alone, or listening to a children’s book you can turn your drive time into family time. I’m not above giving my child’s a tablet for long car rides, but on short stints around town the girls aren’t given that option. 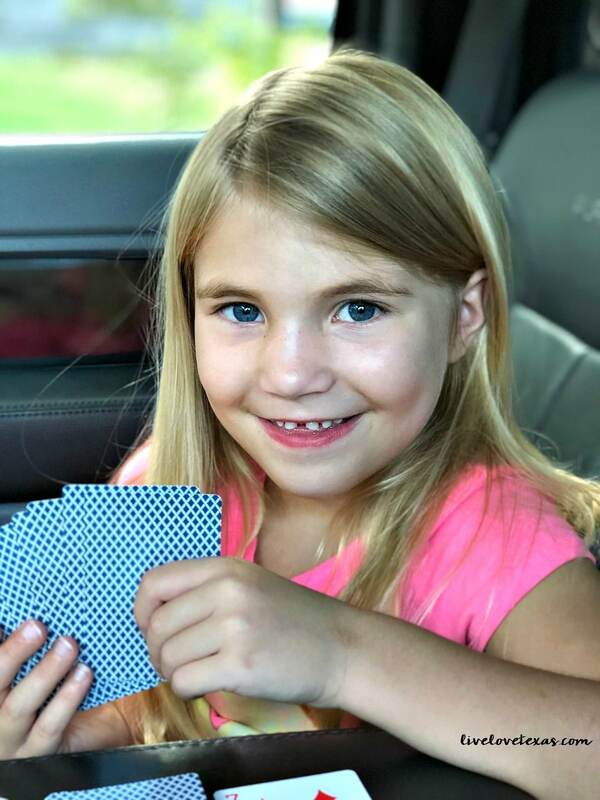 Having books, coloring books, markers, and a deck of cards keep the girls occupied during car rides and can be brought into restaurants to help pass the time. Some of my girls favorite games at this age are Go Fish, War, and Crazy 8’s. 4. Keep a first aid kit with you. There are few things worse than a sick or injured child, so just having the things we need to help them feel better provides a lot of peace of mind when you’re an on the go mom. I like to keep a simple one in my purse with things like children’s medications for headaches, fevers, nausea, and allergic reactions along with antibiotic cream, bandages, and a thermometer to cover any little things that come up while we’re out. But also, have a more complete first aid kit always in the car for more serious injuries. 5. Be ready for life’s messes. Don’t be taken off guard when something comes up because accidents can and will happen. Ask any woman her tips for the on the go mom and I guarantee having baby wipes and/or tissues will come up. Kids are messy and accidents will happen. From wiping noses and cleaning up spills to wiping messy faces and cleaning off boo boos, baby wipes and tissues are a lifesaver when you’re in the car and will keep you from stressing out over spilt milk (which really stinks if not cleaned up right away). Do you have any other tips for the on the go mom? 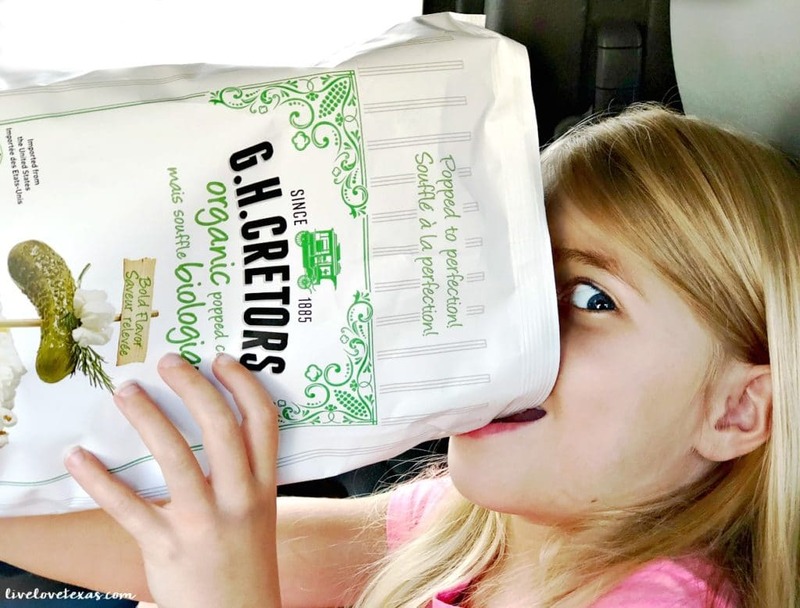 If you’re looking for snacks to feed your kids when you’re on the go, you’re going to want to find G.H. Cretors at your nearest grocery store because it really is the best. Learn more about the products on their website and stay updated on the latest product news, recipes, and ideas by following them on Twitter, Facebook, Pinterest, and Instagram!